Ever since baby, life has been quite different. No longer is there time for leisurely anything, a good time is when I manage to eat 3 square meals and have my teeth brushed before noon. Despite all, I still think it is important to have a little something luxurious in a home. 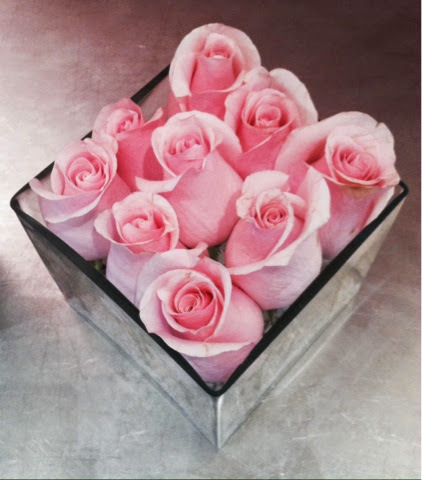 For me, flowers are what make a home more elegant and lively. I recently saw this arrangement at Neiman Marcus. 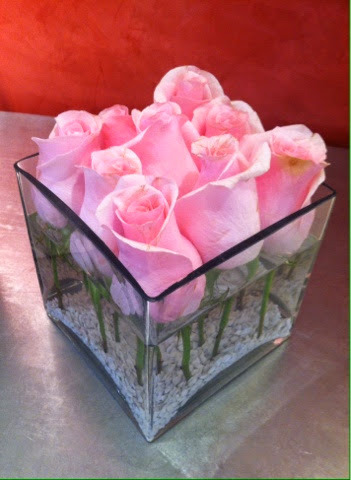 This simple arrangement only requires an inexpensive square vase and 9 large roses with glass or stone pebble on the bottom to hold the stems. It takes literally minutes to arrange but it makes my rooms so much prettier and my day bright. In your busy day, what is one thing that brightens up your house? ?